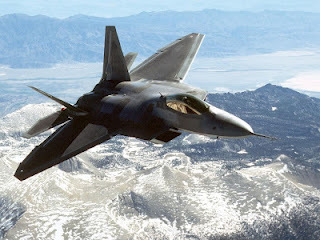 eventually was named the F-22A when it officially came into use in December 2005. Lockheed Martin Aeronautics is the prime contractor is responsible for the majority of the airframe, armament, and the assembly of F-22. Then his partner, Boeing Integrated Defense Systems provides the wings, avionics equipment, and pilot and maintenance training.HistoryAdvanced Tactical Fighter (ATF) is a contract for the demonstration and validation program that made the United States Air Force to develop a new generation air superiority fighter to deal with threats from outside the United States, including the development of the Su-27 aircraft-grade Soviet era.In 1981, the United States Air Force to map the requirements to be met a planned new aircraft to replace the F-15 Eagle. ATF is planned to integrate modern technology such as advanced metal and composite materials, advanced control systems, high-powered propulsion systems and stealth aircraft technology.The proposal for the contract was filed in 1986, by two teams of contractors, the Lockheed-Boeing-General Dynamics and Northrop-McDonnell Douglas, who was elected in October 1986 for demonstration and validation phase through the past 50 months, which ultimately produced two prototypes, the YF -22 and YF-23.The aircraft is planned to be the most advanced U.S. aircraft at the beginning of the 21st century, therefore, this aircraft is the most expensive fighter aircraft, at a price of U.S. $ 120 million per unit, or U.S. $ 361 million per unit when added to the cost of development. On April 2005, total development cost of this program is U.S. $ 70 billion, causing the number of aircraft planned to be made down to 438, then 381 and now 180, from the initial plan of 750 aircraft. One of the factors causing this reduction is due to the F-35 Lightning II will have the same technology as the F-22, but with a cheaper unit price.